Of course me being the random person I am, I always get the “Sorry, pretty people don’t do that” from her. So what is it exactly that pretty people do? Pretty people pay attention to the things around them. Pretty people try to do whatever they can to help those who need it. Pretty people dress up not to impress others, but because they like to look and feel pretty. Pretty people are respectful people. Seeking attention in public? Pretty people don’t do that. Doing whatever they want disregarding others? Pretty people don’t do that. Dressing down or making others feel ugly? Pretty people don’t do that. Being disrespectful especially in public? Pretty people don’t do that. When in public, I enjoy saying the infamous “Hey! How are you?” to people I know because I genuinely want to know how they are and if life is good for them. I like when people say hi to me whether they want to or not because it always leaves with that “Aww. That person cared enough to say ‘Hi’ to me.” It feels nice being nice. That’s something pretty people do. According to my cousin, it’s when I get loud and start laughing like a maniac then she goes “Umm. I’m walking away from you because pretty people don’t do that.” I won’t lie. My laugh is kind of ugly, but is enjoying my time with family or friends ugly? Of course not. It’s when I step out of bounds and disregard everyone else that’s having their own moments with their family and friends and unknowingly interrupt them with my big mouth. Sorry, pretty people don’t do that. I’m sure we all have our ugly moments. I know I have MANY ugly moments. This doesn’t stop me from reminding myself on a daily basis, “Sorry, pretty people don’t do that” whenever I’m about to have an outburst, go crazy or get out of hand. That’s what pretty people do. If you think about, it’s actually a good catch phrase, am I right or left? If there was any object that would define me, it would be my iPhone. Why? Because I’m forever on it. The iPhone is my link to everything and everyone. If you were to ask my friends, they would say the exact same thing. Whether I’m at home, work, church or out with my friends and family, I can guarantee you I am either looking at my phone every five minutes or on it for a good ten minutes before getting back into the action thats going on around me. It’s a bad thing because I sometimes get so busy socializing with others via my phone that I forget about the world around me. I miss out on real moments because I’m focused on the current conversation I’m having with my friends elsewhere. I lose interest quickly so if I get bored with the real world I automatically revert to my iPhone to find entertainment elsewhere. The sad reality of this is most of this generation is like this. The idea of self-promotion is so prevalent in today’s world that most try to figure out different ways to entertain the masses and some even define their self worth based on the number of followers or how much feedback they receive from what they post online. WHOA! Ok back pedaling on the bunny trail I just took off on. My iPhone though >>>>> love of my life. Today’s writing prompt is entitled “Nosey Delights”. There’s nothing more delightful to me than the smell of a fresh blooming pua or plumeria. When I was living in America, the number one scent I would miss is the smell of fresh puas outside of my home. 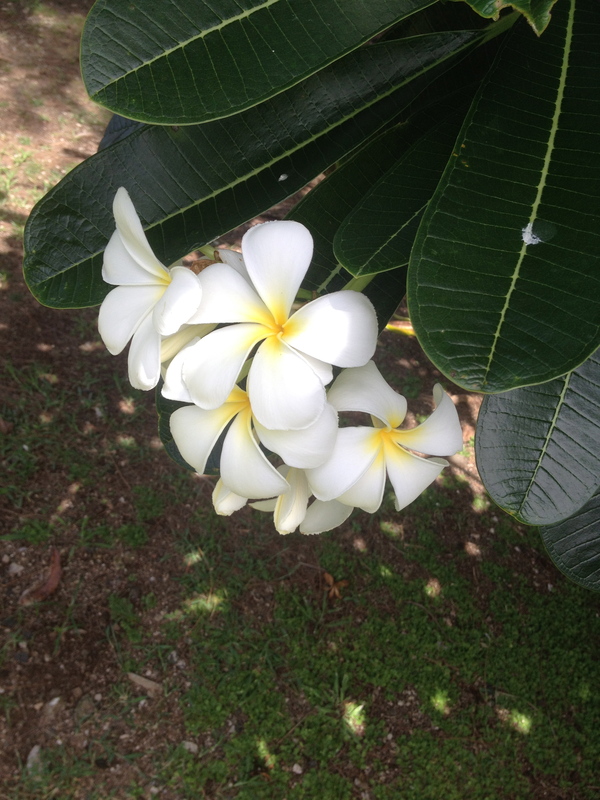 I actually didn’t learn the English term for pua, which is plumeria, until I visited Australia in 2005. Every morning, I go to visit the pua tree outside of my house and there never fails to be newly blooming puas on the tree. In some seasons, there are really big ones and in other seasons they bloom a lot smaller. The beautiful aroma remains the same. The scent takes me back to my younger years when we use to climb the pua trees outside of my old church and play tag. Sometimes we would take sticks and poke at the branches until the flower fell so we could wear them as seis. I love wearing them as seis (flower worn on the ear or placed in the hair). They add to the natural beauty of any Samoan or Pacific Island lady. Puas are just as much of a nosey delight as they are pleasing to the eyes. Don’t you agree?